For the best candy roll and tablet in the country, go only for the best and smart choice – Smarties! These yummy delights may just be one of the best tasty creations, ever since it was first launched last 1949. As such, we’d like to put the spotlight on these treats today, with the hope that you’d indulge on these candies soon after! It all started with a family, when Edward (nicknamed Eddie) Dee migrated to New Jersey from England. Eddie, with just a rented facility, two candy machines, and pure and true grit, went on to found the Ce De Candy, Inc. company. Three generations later, and a shift on branding to the Smarties Candy Company (aptly named so because of the family’s well-known sweet creation), the Dee family continues to forge on and provide the country with the best in candy rolls in the sweets industry. As a matter of fact, those 2 machines that first started production transformed into two massive factories (with a non-stop, 24-hour candy production schedule) located in New Jersey (Union) and Ontario (Newmarket) – with billions of candy tablets, lollipops, and Smarties rolls produced on a yearly basis! Additionally, Smarties has a nutrition-focused production – a bold move, considering that it’s a candy product! Each classic Smarties candy roll has only 25 calories. This means that those who have a sweet tooth while still being conscious on his or her health won’t go wrong indulging on these treats. Another health-centric factor to consider when eating Smarties products is that all creations from this company are top allergen, gluten free, and peanut free. This just means that those with pesky allergies or individuals diagnosed with Celiac disease can enjoy a Smarties treats – a perfect way to enjoy a candy! And with the mentioned ingredients above, Smarties products are also vegan friendly – another reason for vegetarians to go out and enjoy some sweet delights! Smarties are sold in the United States and Canada. In Canada, however, Smarties are named as Rockets. This is to avoid confusion with similar products in the market. Why the name Smarties? Although the official site gave no exact definition or explanation, it can be assumed that this candy’s peculiarities offer a smart take on enjoying a sweet treat. After all, with its nutritional take yet not withholding any loss on taste approach is indeed a smart (and maybe even fun) way to enjoy candies! Of course, a smile and a sweet experience! 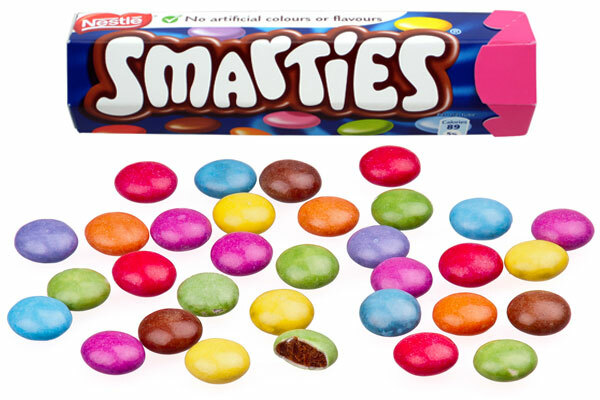 Smarties are available in different variants or forms (and in different bags). As such, we will also list down several packaging options with the highlighted products below. The sweet creation that started it all. Coming in several flavors and colors randomly packed in one bag, these are yummy delights that cemented this candy tablet’s name in history. Similar candy tablets, yet both candies having unique taste qualities. No clear winner for this case – both choices are definitely a wonderful taste delight that everyone should experience. But why doesn’t the Smarties Candy Company create their own chocolate? Perhaps it all boils down to the adage, if it ain’t broken, don’t fix it! As far as we can tell, Smarties candy tablets and rolls work! Enjoy a Smarties treat today! You just need a smart and excellent way to enjoy candy – and this option definitely offers you a reason on why you should head on out and enjoy something sweet!